This entry was posted in best friends, Camellias, Cats, Focal Point, Garden Design, Outdoor Living Spaces, Shade Gardening, Small trees, winter garden and tagged Camellia 'Daikagura, Camellia Ava Maria, Camellia Cotton Candy, Camellia Martha's Dream, camellia Yultide, Focal Point, Ginkgo biloba, Margaret Moseley, Prunus 'Kwanzan', Prunus mume, Seating area. Bookmark the permalink. Thanks for sharing. I enjoyed this visit. The camillias are gorgeous! What a lovely garden and gardener. Thanks for sharing with us. Happy Holidays! Beautiful! I’d love to see that ginkgo in full leaf. One of my very favorite trees, and Margaret’s ginkgo is huge…I’ve got tree envy! 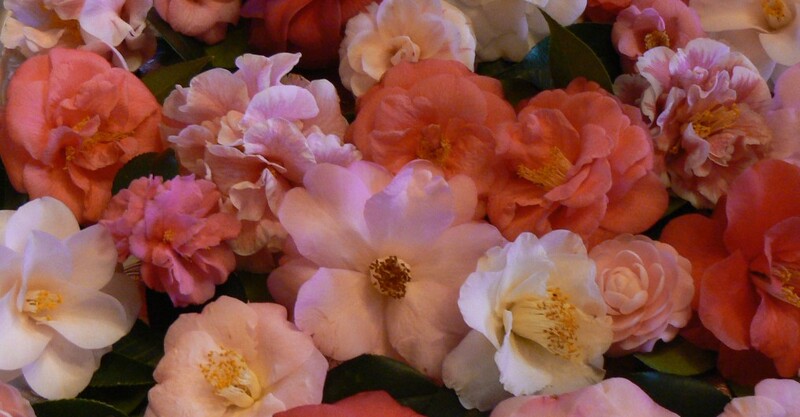 Helen, the early blooming camellias are C. sasanqua, cannot imagine there are none in the UK. They are a joy this time of year.